First, you need to set the root user’s password on the NAS to be the same as the Admin user. Go to the PuTTY Download page and download putty.exe and plink.exe. You can just put them in C:\. Open DiskStation on the Synology NAS and then open the Control Panel. 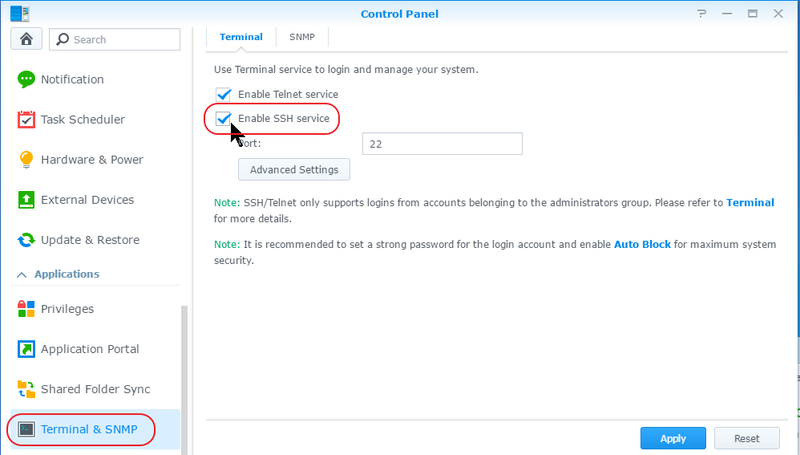 Select Terminal & SNMP and select the Enable SSH service option. Click Apply. On your computer, run Putty (there is no install). In the Host Name field, enter the IP address of your Synology NAS and click Open. In the window that appears, log in as admin. Enter your password when prompted. You’ll be prompted for your admin password again. Type it in and press enter. 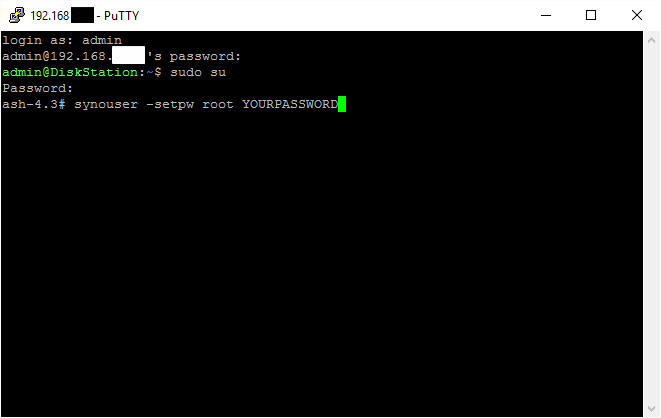 This command changes the root user password to be the same as the admin password. Obviously, replace XXXXXXX with your admin password. 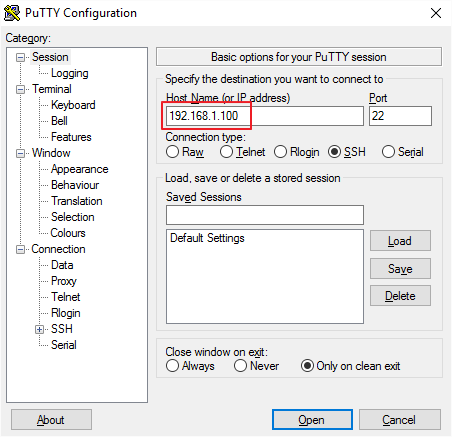 You can now close down Putty. 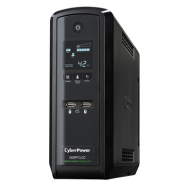 Download and install the Business Edition of the CyberPower PowerPanel software. If you’ve already installed the personal edition, uninstall it. Open default.cmd in a text editor, like Notepad. Look for the :doEventOccurCommand label and add the line in bold below that starts with echo. rem The commands will be ran when an event occurred. Run PowerPanel Business Edition (it opens in your browser) and click Events. Click on the Shutdown initiated row to select it. The fields will become editable. Under the Command heading, set Initiated to Instant, Duration to 1 min and File to default. Click Apply. When a shutdown is initiated, the default.cmd file you edited will be run. The program will wait for 1 minute before shutting down your computer. HINT: I suggest you copy the command right out of your default.cmd file, so you know exactly what will be executed. Make sure this turns off your NAS. Note that this may take a minute or two. If that works, turn your NAS back on and wait until it’s fully booted. Go back to PowerPanel Events. Select the Utility power failure row. Under Shutdown, set the Initiated setting to Instant and click Apply. It takes a while for the Synology NAS to power down, so your computer may shutdown first, even though you have a one minute delay. Hopefully, the NAS will shut down eventually. If that works, change the Utility power failure Shutdown setting back to inactive and apply. If it doesn’t work, go back and recheck everything. You should be able to get this all done in about ten minutes. Your welcome. Hmmmm not sure Greg. Are you sure the command gets executed? If not, try putting a .exe path and file in the command line to see if it even gets called. If you are saying that it does get called but it just doesn’t turn the NAS off, I don’t know what to suggest. I wonder if its a permission issue. Sorry I’m not of more help. This helped me out and I might be able to answer the question above for future reference. There are two issues. It seems that plink now gives a message to the console waiting for a return press unless you include the -batch option. Also, if you haven’t connected before, the host key is not cached, and even if you connect by running the command in command prompt, it will only cache the keys for the current user. I suspect PowerPanel runs it as SYSTEM or something, so the keys are not cached for that user. For this I deleted the cached registry keys (HKEY_CURRENT_USER/Software/SimonTatham/PuTTY/SshHostKeys) and then ran the command again from command prompt. When it asked me if I trusted the host, I copied the key to add it to my command in default.cmd. Also, I added the admin user to the sudoers file so that it would not request a password a second time.